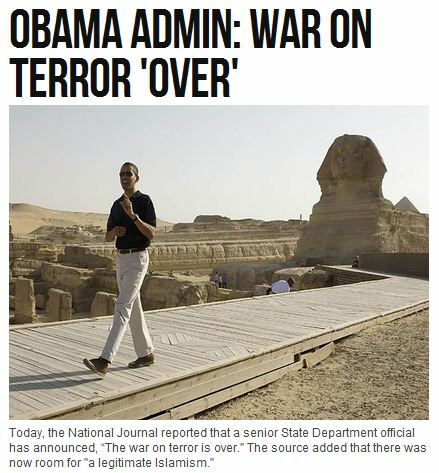 OBAMA ADMIN: WAR AGAINST ISLAMIC FUNDAMENTALISM IS OVER……. – The Tundra Tabloids……. OBAMA ADMIN: WAR AGAINST ISLAMIC FUNDAMENTALISM IS OVER……. The Fundamentalist Muslims beg to differ. Remember folks, it’s always about the jihad, through violence or by stealth, the aim is always the same, to instill the sharia. The necessity of getting Obama out of office come November, and holding faux conservative Mitt Romney’s feet close to the fire, couldn’t be of more importance then now. Obama has done incredible damage to the country, with the stealth jihad being waged upon ever branch of government, just as the communists have done decades before them. NOTE: Call me cynical, but I believe that Obama and his cadre of radical marxist nut-jobs know exactly what they’re doing, and it isn’t for our benefit, that we’ll be better off for it. Previous Post Previous Post BREAKING: THE MUSLIM BROTHERHOOD IN AMERICA COMES ONLINE……..
Next Post Next Post OBAMA INSTALLS WOMAN WHO ADVOCATED INVASION OF ISRAEL TO HEAD HIS NEW ATROCITIES PREVENTION BOARD…….